What is composite clamp carbon cloth Filter? Natural coconut shell activated carbon has large specific surface area and high strength, uniform particle size, well developed pore structure and strong adsorption performance. It can quickly capture decomposition formaldehyde, toluene TVOCs and other harmful gases. Why use composite clamp carbon cloth Filter? Firstly , particles with smaller diameters can be wrapped between the HEPA filter and the support layer, its has larger contact area to the air and its adsorption effect on pollutants like formaldehyde are more remarkable. 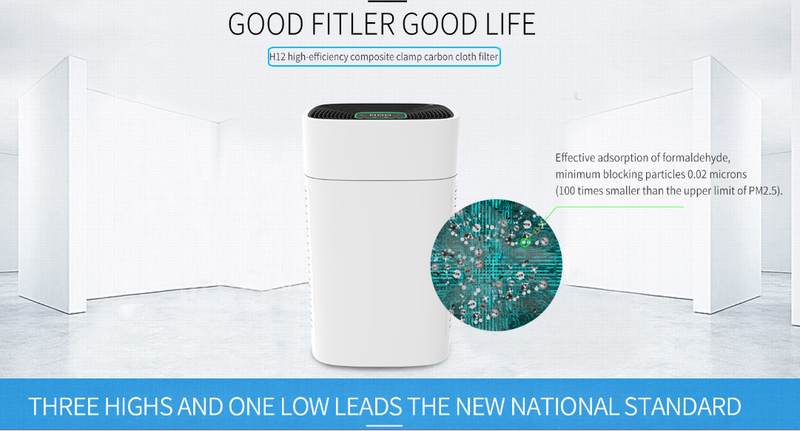 The filter resistance is lower than the common HEPA + Activated Carbon Filter. Secondly, composite clamp carbon cloth Filter can effective filter harmful particulate matter, formaldehyde and other volatile organic compounds as small as 20 nano meters and PM2.5, at the same time, it has high efficiency filtration of various allergens and common bacterial viruses. The weight of this double filter is about 800g, relatively light. The inner inter layer is made of functional particles processed by special technology, the surface is filled with tiny pores.Compared with the commonly used coal carbon materials in the industry, its safety and high efficiency will not produce dust, furthermore, after processing, the functional particles have high surface area, which increases the Increased Chemical adsorption and catalysis. At the same time, it can catalyze the oxidation of organic compounds in air and convert them to CO2 and H2O, so as to solve the pollution problem fundamentally and avoid the secondary pollution of formaldehyde caused by adsorption saturation. Therefore, the CCM value of this composite filter is higher.